As a family business you would expect antiques to be in the blood: as indeed they are. Phil’s parents ran the much loved antiques shops Lyme Street Antiques, and South Street Antiques, both in Axminster, for many years. In fact, Phil’s earliest memory is going to an antiques fair with his mother when he was just 4 years old! Phil has over 30 years experience in Antiques and Auction Rooms, both locally and further afield. He particularly loved his time at Christie’s in South Kensington and started the week they sold Van Gogh’s “Sunflowers” for £19.5 million. He likes to think he was the lucky charm that day, and has enjoyed much success for decades within various auction houses around the country. Since settling back locally, he has always lived within 5 miles of Axminster, and has always had affiliations with the town, including the Drama club and Operatic Society. More recently he has been self-employed within the antiques trade – specialising in house clearance and estate work liaising dealing with solicitors and local estate agents to administrate probate and insurance work. Which leads neatly on to his own auction house in the same street as his parent’s first shop! 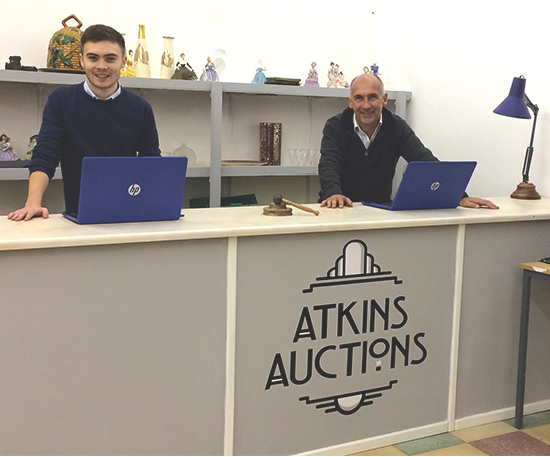 Atkins Auctions is very much a family affair with his son Christopher starting his career in the antiques world, and becoming the 3rd generation involved in the antiques trade (we may have to wait a few years for the fourth generation to join us, as Phil’s grand-daughter is only 3). Phil’s wife Becci is also involved on sale days as well as behind the scenes and on the social media side. 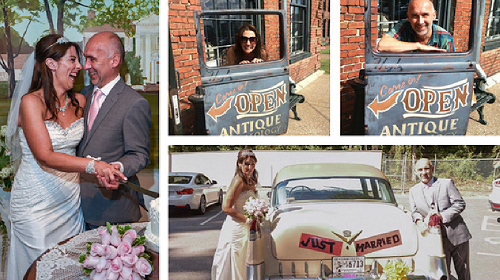 Phil and Becci were married in 2016 in Memphis, USA, spending their honeymoon driving around the Deep South. Even then, Phil insisted on popping into every antique mall and garage sale they passed, resulting in some great finds and the need to buy larger suitcases to get it all home!